With echoes of Erik "Hamtastic" Friborg's voice ringing throughout the room, the final event of Wednesday came to a head. Three members of the Wizards team came strolling into the War Room. Dave Guskin, Zac Hill, and Mike Mikaelian entered the room to a chorus of boos and took their places behind their computers. The format for this Multiball challenge? 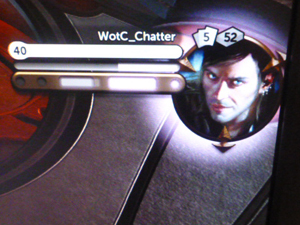 Archenemy, on the PC version of Duels of the Planeswalkers 2012. Behold, the archenemies! 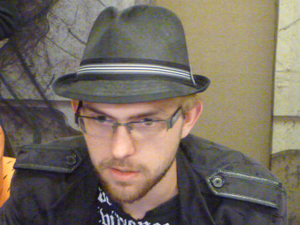 Tremble before their might and awesome fedoras! This year, Multiball was run a little different. Rather than a full-on multiplier, the two teams played two rounds of play, each match worth five points. At the end of Multiball, the points earned would be added directly to the winning team's score. That meant that thirty points were up for grabs, thirty points that could change the texture of the tournament. The Community team broke into three-man cells. Luis Scott-Vargas, Bing Luke, and Enigma squared off against Zac Hill. Marshall Sutcliffe, Sunie, and JoeKewwl faced Mike Mikaelian. ChrisKool, Whiffy, and Graham Stark rounded out the last match against my eternal archnemesis: Dave Guskin. 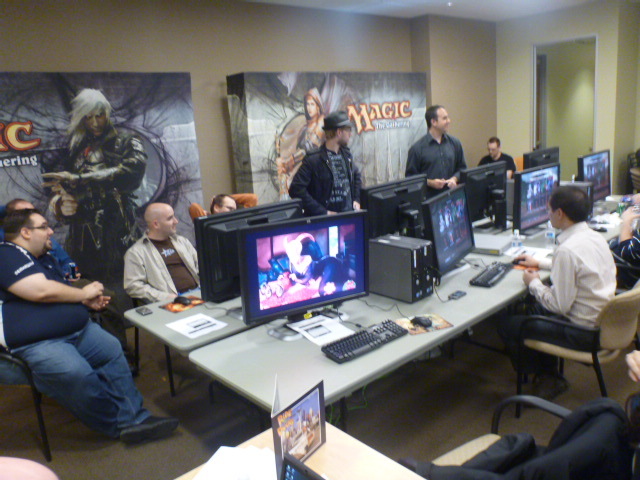 With the teams and matchups set, the players selected their decks and set about their matches. The Community team has quite the Mountain to climb! The first player to draw blood was the archenemy Zac Hill. His Mono-Blue deck churned out advantage after advantage thanks to his scheme cards. 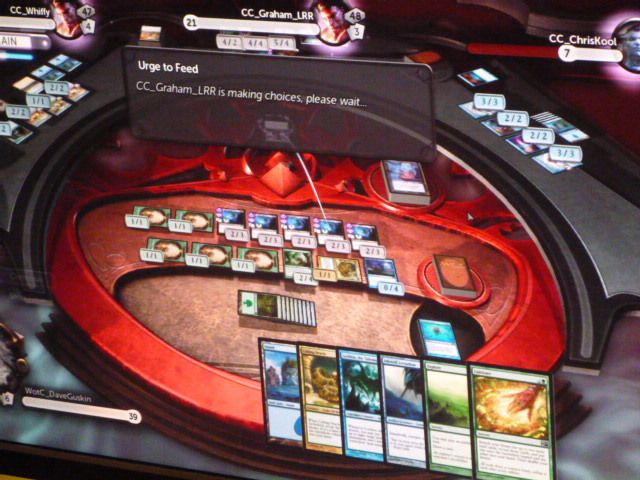 The trio of Mono-red aggro decks played by Luke, LSV, and Enigma couldn't overcome the power of the scheme cards. As LSV put it, "When you're playing 2/2s and your opponent is playing free cards that are more powerful than three of your cards put together, it's hard to win, even if there are three of you." Enigma dropped first, with LSV right behind. Still sitting pretty at over 20 life, it was mere child's play for Hill to crush Luke's opposition and give the Wizards team their first five points. The resemblance is uncanny. Zac Hill is the dreamiest. This is the face of pure evil. Only a man as thoroughly evil as my personal archenemy Dave Guskin could make beings as powerful as the Eldrazi his thralls. Thanks to his scheming ways, he introduced the trio of ChrisKool, Whiffy, and Graham Stark to his good buddies Kozilek and Ulamog. When the Elven armies of the Community rose up to fight them, Guskin used a Rite of Replication to manufacture an Elven army to match them. When the dust settled, the Community had put up a good fight, but even one as powerful am I am unable to stop the beast that is Dave Guskin. While the third match was still underway, with the Community's Lorthos, the Tidemaker (not to be confused with Lorthos Thompson) trying to give Mike Mikaelian a sloppy hug, the first Community trio has swapped up their decks and decided to make a second run at the nefarious, yet dreamy, Mr. Hill. Unfortunately, Hill's Diabolical Vision involved forcing the Community to effectively mulligan to four, shuffling their hands back into the deck and drawing new hands of four cards. As Hill put it immediately thereafter, "Skill game." With his sick skills, Zac Hill put the "All-Ringer" Community team of LSV, Bing Luke, and Enigma to rest. 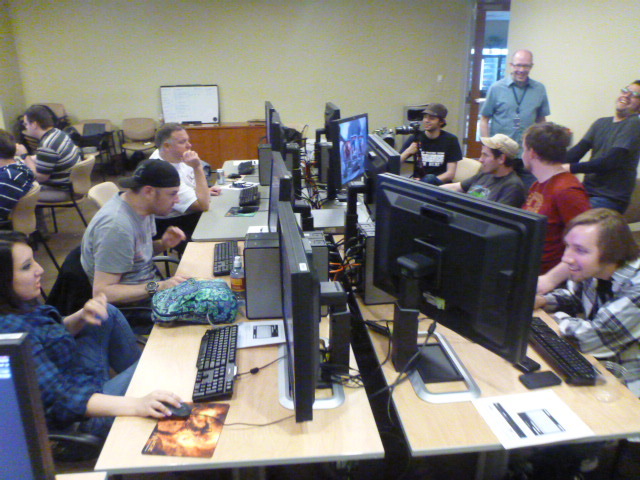 Despite starting out waaay behind, the Community team still had smiles on their faces. Being a part of this experience will do that. 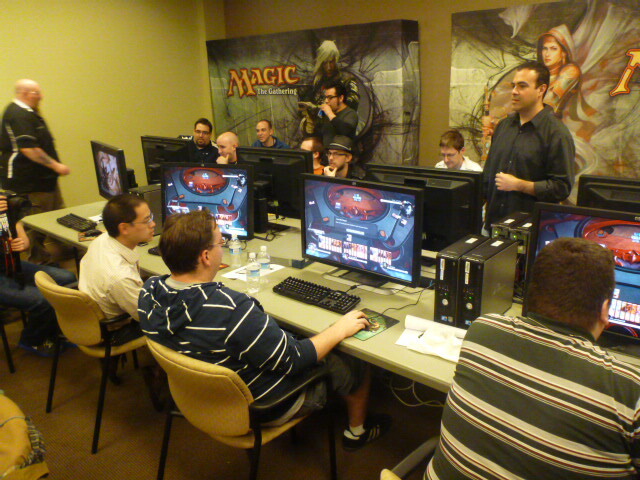 With one match in the books, the WotC team had pulled to within five points of the Community team. Soon after Hill won his match, Mikaelian managed to squirm out of the Freshmaker's grasp, wriggling his way to his first match win. Guskin managed to raise a clone army of Wampires to take his second match as well. That put WotC ahead by five points with the last match still to play. It came down to the team of Marshall Sutcliffe, Sunie, and JoeKewwl and their final tangle with Mikaelian. Unfortunately, the Community was not destined to win. Sunie, Joe, and Marshall put up a good fight, but in the end, the overwhelming force of Mikaelian's Esper deck and his filthy, filthy schemes proved far more than they could handle. As the final points of damage were done, the Community team appeared crestfallen. After a few moments of shock, the smiles crept back onto their faces as they started to complain about the results of Multiball. They were actually enjoying trolling WotC about their loss! With Multiball over, but the fiery discussion about Archenemy still raging on, the WotC team had edged out a 10-point lead, crawling out of their 20-point hole. 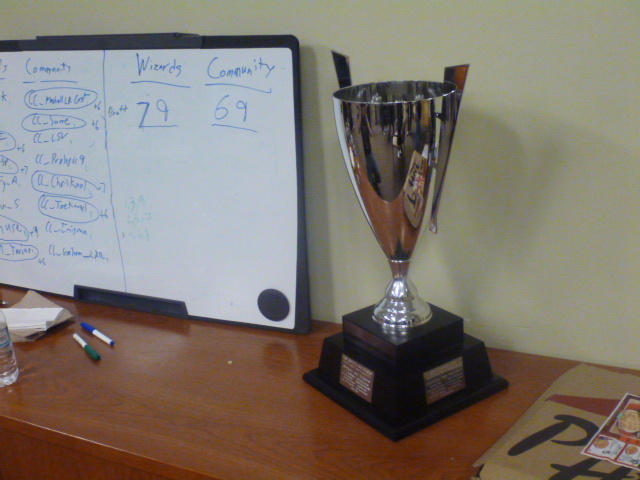 Two events remain for the Community to regain the lead. Their first opportunity is the new kid on the block: Unified Modern. The lists are in, but are they better than Max McCall's WotC creations? The scoreboard will tell the tale soon enough. Scoreboard, guys. Oh, and Hamtastic Cup, too.